The sign over the door read “TRANSMOGRIVACATIONS, INC.” and in smaller script underneath: “BE ALL SOMETHING ELSE CAN BE.” There was an enchanted logo next to it depicting a cartoon man changing into a lion, a dolphin, an eagle, and then a man again, over and over. Parkleman stared at it for a long moment. “You can really change me into anything I want to be?” he asked again. The mage behind the desk raised an eyebrow. Parkleman considered. Everyone he knew had already transmogrified at least twice. James in his office had been a silverback gorilla last year, Carl in Marketing had pictures of himself as a 20-foot python on his desk, and every summer Mr. Bruteby came back to brag about the stunningly beautiful animals he’d run down and eaten. Mentioning his plans had been a mistake, though. Mr. Bruteby had laughed long and hard when Parkleman had put in for his vacation, and loudly congratulated him since being even the tiniest, most helpless animal had to be an improvement over being Parkleman. Parkleman felt his face heating up again as he remembered the pitying look Miss Dabishy had given him as he skulked out. Even if he spent two weeks as whatever lived underneath dung beetle dung, it would be worth it to get away from Mr. Bruteby. “I’ll take it,” he said firmly, and he realized with a start that he was actually looking forward to it. There was paperwork. There were rituals involving chalklines, powders, and rare unguents. There were gods to be appeased. There was a final waiver. There was a flash of light. And he was a lobster. And it was everything the mage said it would be. Parkleman almost forgot to be amazed that he was breathing water and had somehow misplaced 98% of his body mass. Secure in a small cave under an outcropping with plenty of easily accessible food, he sat and simply stared at the brilliant colors and vivid patterns of the fish as they swooped past in endless variety. 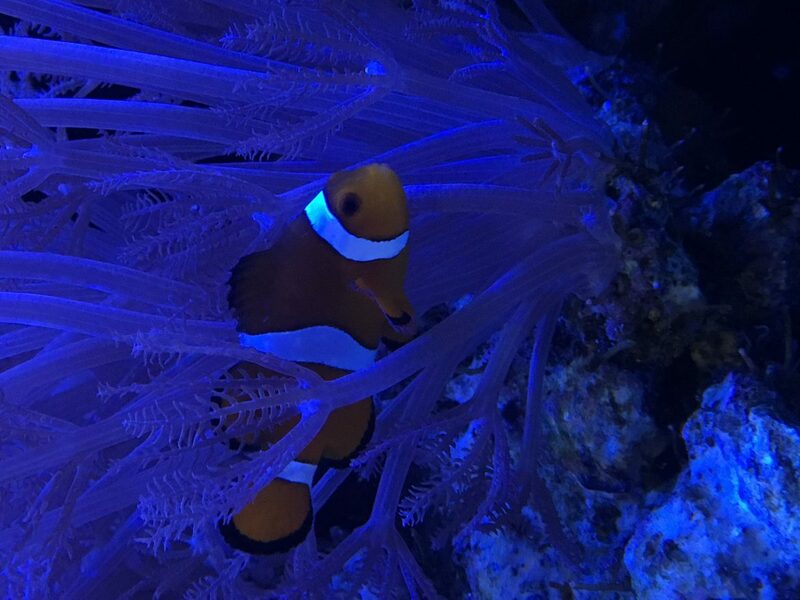 A clown fish stopped long enough to favor him with a wink. The sea was so full! Vast cities of coral reefs and sponges dotted the ocean floor creating intricate labyrinths he could explore for hours. He spent an entire afternoon watching the mesmerizing undulations of a clump of kelp, fascinated, as sunlight dappled down from the surface far above. And the constant movement of the ocean itself was incredibly calming. He felt nearly weightless, floating in the all-encompassing embrace of the water, intimately connected to everything around him for miles. There is a freedom to be found by giving yourself over to something far more powerful than yourself, and he gave himself utterly. No responsibilities, no deadlines, no pressure. Parkleman was completely at peace. Fish scattered as Mr. Bruteby swam past, crunching a last few bits of Parkleman in his powerful teeth and reveling in the feel of unstoppable force. What’s a vacation for, he thought happily, if not for doing what you can’t do the rest of the year? And the shark charged off into the deep, reveling in predatory bliss.